100 Year Time-lapse project. 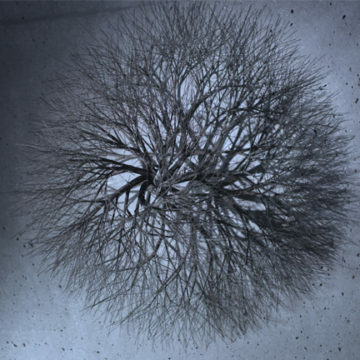 A film by Kieran Baxter and Kieran Duncan, Additional footage by Þorvarður Árnason, 2017. With time-lapse photography we are able to visualise changes that are otherwise too slow to be visible. 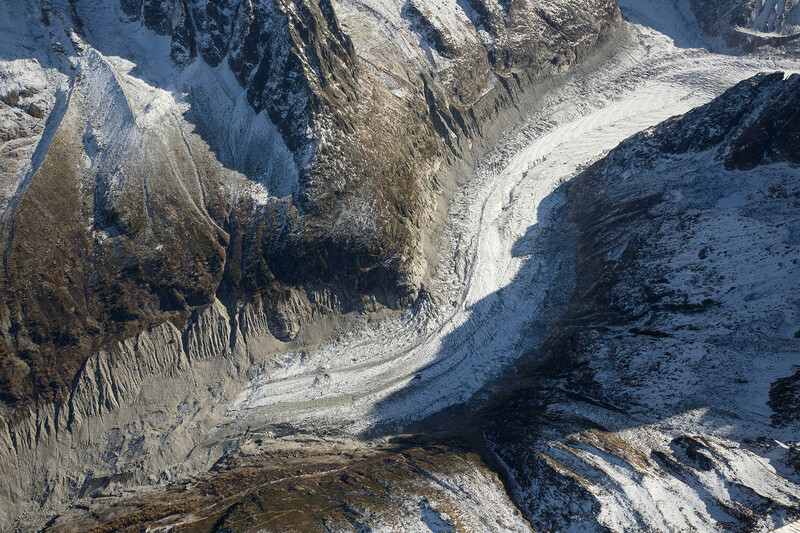 Over hours or days we can see surprising changes in glacial landscapes. To witness the full extent of long-term changes, however, we have to view the landscape from above, and over the course of years or even decades. Using digital analysis, we can now recreate the photographs taken during Eduard Spelterini’s pioneering balloon flights over the Alps in three dimensions. 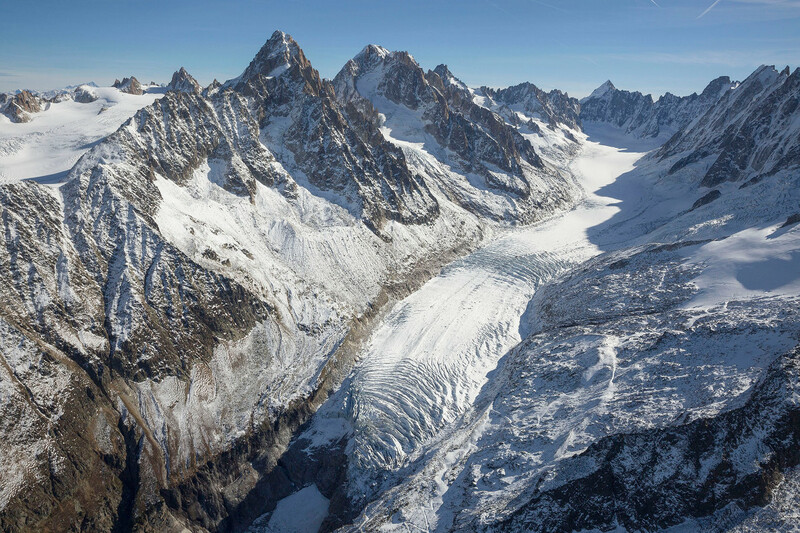 In 2017, more than 100 years after Spelterini’s flight, a team from Scotland returned to the exact location above Mer de Glace in the French Alps to photograph how the glacier looks in the current day. With a sequence of overlapping photographs the changing ice surface can be digitally modelled. This technology allows us to visualise not just the physical changes, but also the changing aesthetic of the landscape. Although they were unaware of it at the time, the pioneers of aviation and photography began this project for us over a century ago. 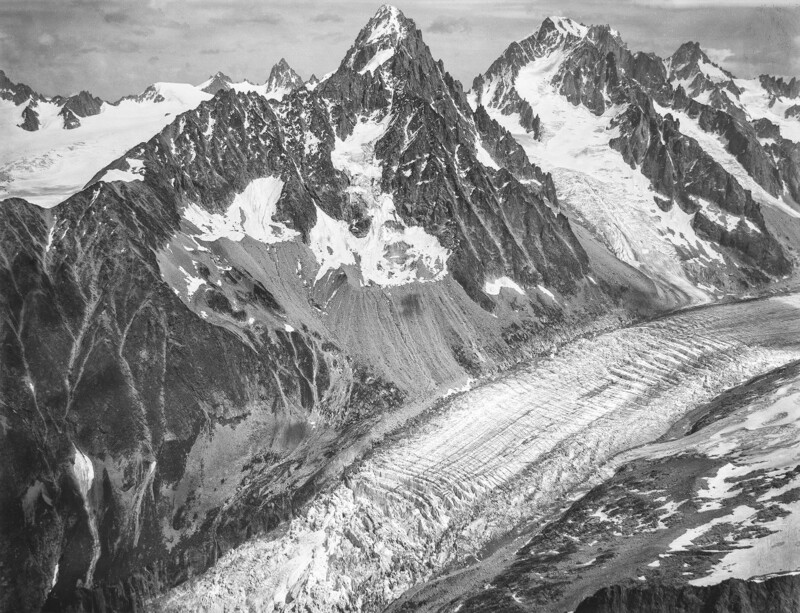 To carry on their legacy, we must consider how we can use technology to record the gravitas of glacial landscapes that will not be around for future generations to experience. Eduard Spelterini was a Swiss aviator and photographer who lived from 1852 to 1931. In 1898 he became the first person to traverse the Alps by air, making the perilous journey in a gas-filled balloon accompanied by geologist Albert Heim. 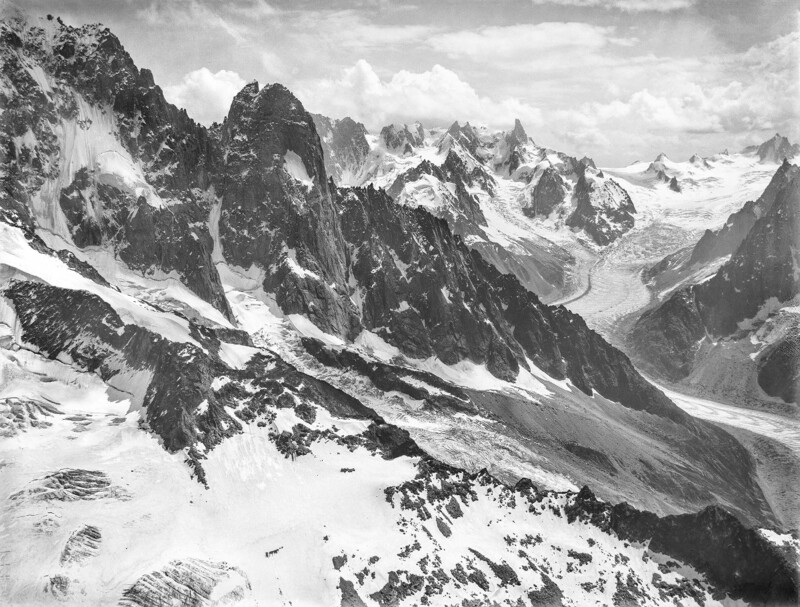 Spelterini brought a hefty glass-plate camera aloft and recorded never-before-seen views of the alpine landscape from above. While for the most part his photographs focus on the peaks and mountains, some images take in the glaciers of the region. 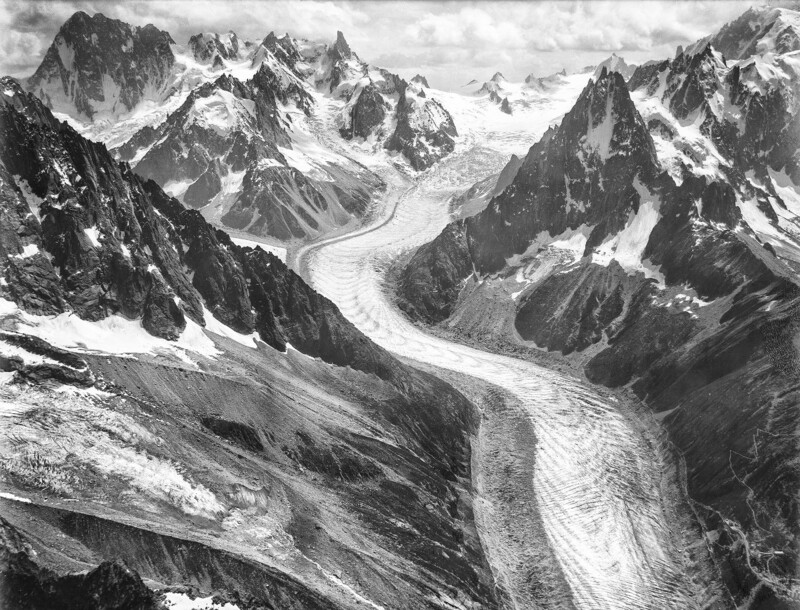 During a trans-alpine crossing in 1909, the dramatic sweep of the Mer de Glace above Chamonix in France caught Spelterini’s photographic eye. 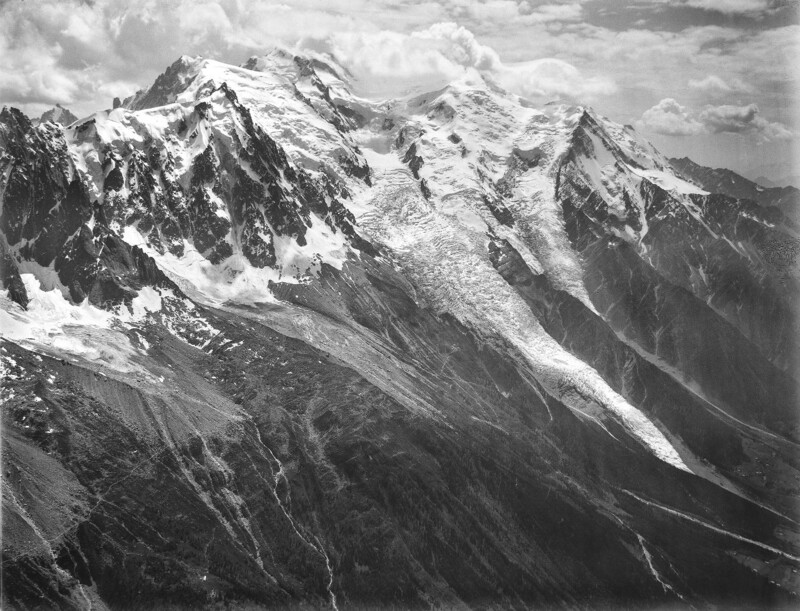 The resulting sequence of photographs serendipitously provided a historical record of the state of the glacier that is unique in its antiquity and detail. 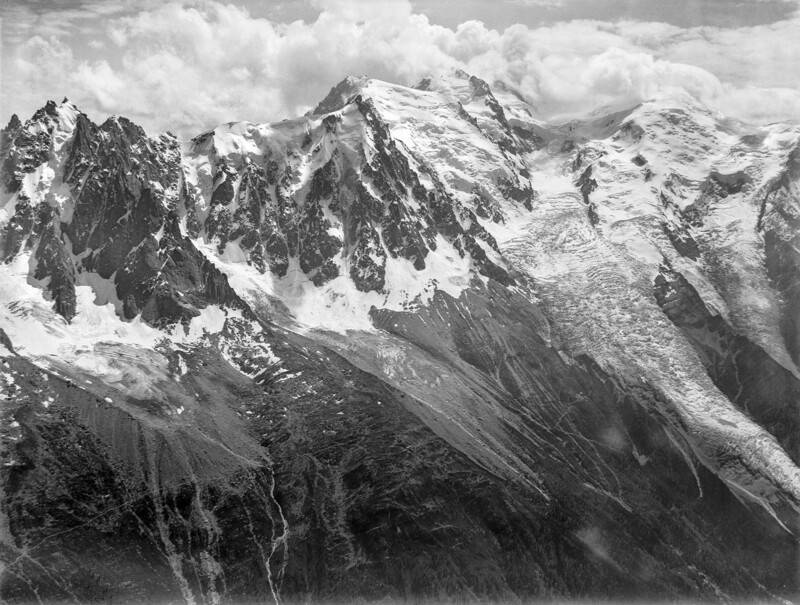 Aerial photographs taken by Eduard Spelterini in 1909 include the Mer de Glace, Argentière and Bossons glacier. While Spelterini was very aware of the scientific benefit of such images, his focus was on geology rather than glaciology, the latter being a relatively unexplored field at the time. While rock formations were comparatively fixed, the idea that the glaciers might radically change in the decades that followed had not yet occurred at the turn of the twentieth century. As well as being driven by scientific objectives, what makes Spelterini’s photographs precious is their aesthetic sensibility. 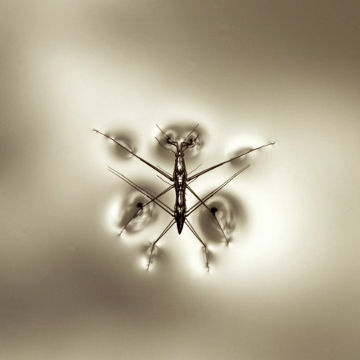 In a time when the lines between artistic expression and scientific imaging were less clearly defined than they are today, much of his work serves as both photographic record and artwork. As a result, his images appealed to a broad audience. Spelterini coloured some of the images, including one of the photographs of Mer de Glace, and showed them at slideshows wherever he travelled. Almost a century before Yann Arthus-Bertrand’s Earth from Above brought aerial photography to a global audience, Spelterini was drawing crowds eager to witness his aerial images of distant landscapes. 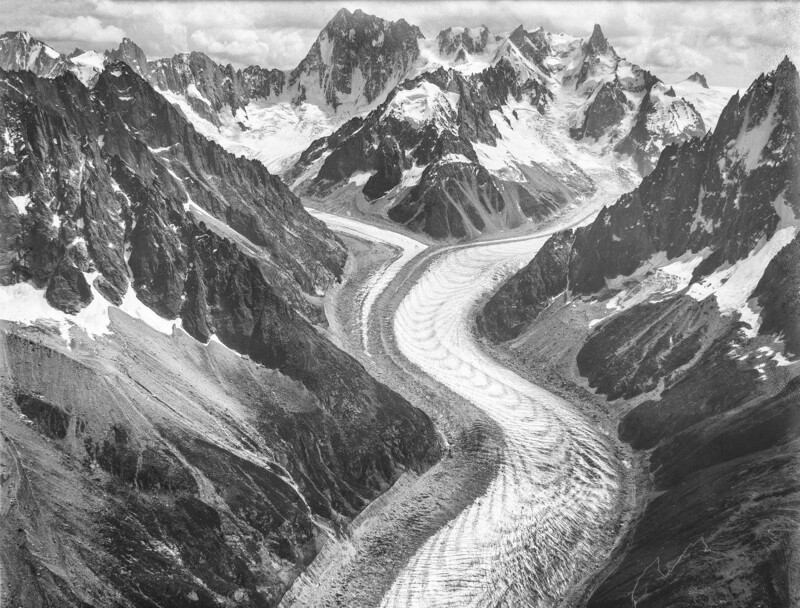 When Spelterini photographed Mer de Glace in 1909 the Wright brothers had already proven the potential of powered aircraft as a far more resilient and maneuverable alternative to the lighter-than-air balloon. This revelation, coupled with the technological demands of World War One and Two, would propel the airplane from the kite-like contraptions flown by the early pioneers to a versatile aerial platform that would eventually become a widely used form of transport. Ironically, while the aerial observations made from such aircraft continue to provide a crucial contribution to our environmental awareness, the widespread use of air travel has also made a considerable contribution to environmental change. Just as Spelterini’s photographs brought the dynamics of vast landscapes down to earth and into the public imagination, today aerial photography and remote sensing are key to both scientific and cultural understandings of our environment. The photographs of the earth taken from above and beyond the highest altitudes, the Blue Marble and Earthrise images taken from space during the Apollo space program, for example, became emblematic of the environmental movements of the late twentieth century. Despite this, the technologies of powered flight that enable us to see the earth from above have, until recently, relied on vast quantities of fossil fuel and involve significant carbon emissions. Eduard Spelterini never got onboard with the revolution of powered flight. He died in obscurity after the demand for a skilled balloon aeronaut had faded away. In his photographs we can see the photographer’s reverence for the beautiful yet foreboding alpine landscapes that passed slowly beneath his balloon. The images, like Spelterini himself, belong to an altogether more romantic era when our relationship with the environment was defined by curiosity rather than conflict. 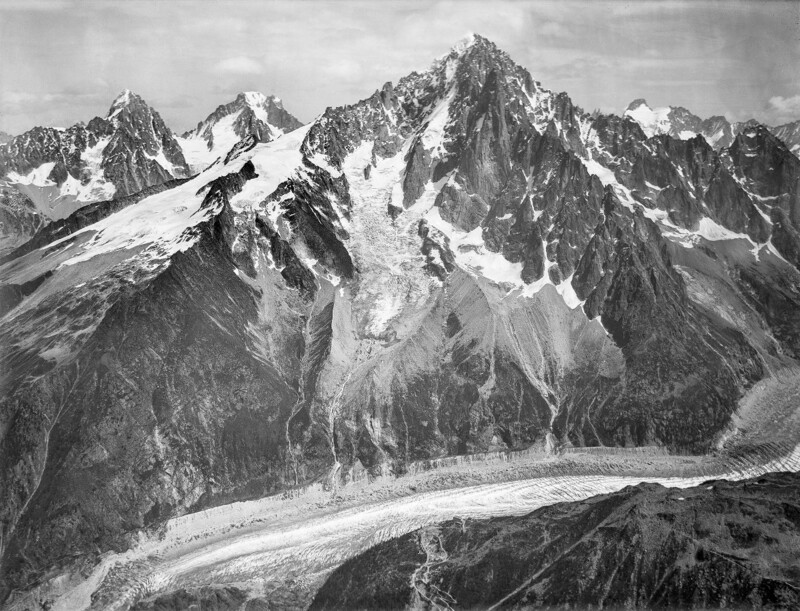 Digital technologies have provided new opportunities for revisiting historical aerial photographs like those which Spelterini took above the Mer de Glace. Where photographs overlap, three-dimensional information can be extracted from the two-dimensional images using photogrammetry software. This method is descended from manual processes that were used to convert air reconnaissance photographs into measurable maps as far back as the 1930s. 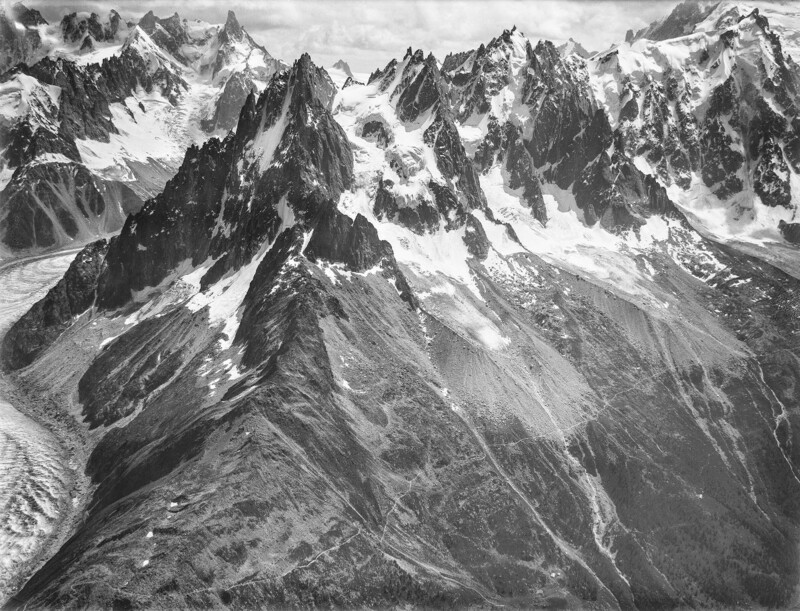 By analysing the arrangement and movement of fixed points in the landscape – in this case the peaks and spires of the Mont Blanc massif – the position where each of the original photographs was taken from can be found. This allows us to plot the flight path of the 1909 balloon flight along a series of points which represent the photographs. As the calculation is refined we see a line of points of varied height but little side to side movement, as the balloon cannot be steered. 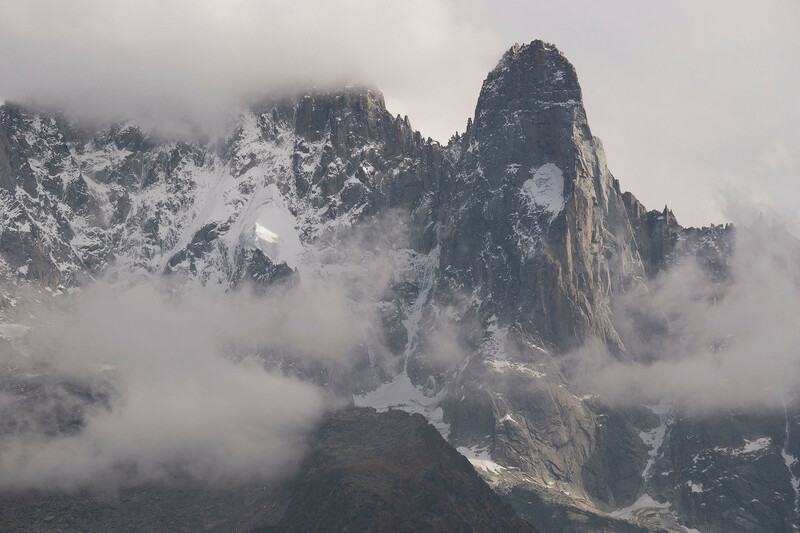 The variation in height is likely to relate to where Spelterini released ballast and vented gas to reach a desired altitude around two thousand metres above the valley floor. The positions of the historical aerial photographs delineate the path of Eduard Spelterini’s 1909 balloon flight, here superimposed upon a high altitude aerial photograph of the region taken by James Gentles. 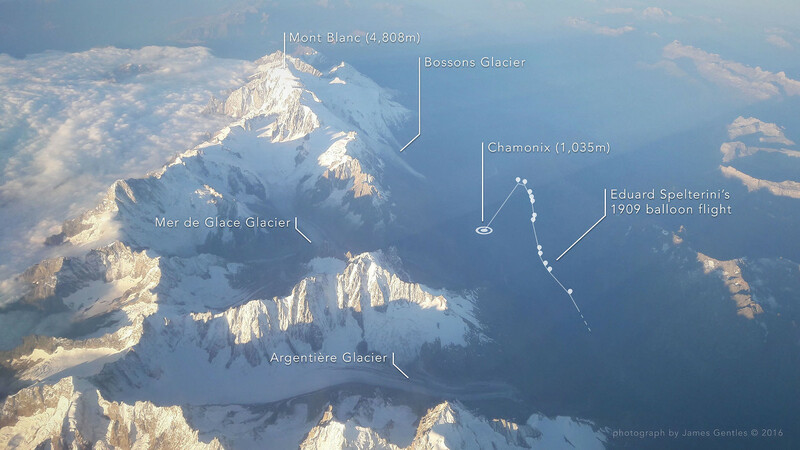 As the balloon left Chamonix, a sequence of twelve photographs was taken at various angles covering the summit of Mont Blanc, Bossons Glacier, Mer de Glace and Argentière Glacier. Each photograph has now been geo-located, meaning that its position can be converted into GPS coordinates. We can say, for example, that the image centred upon Mer de Glace was taken from N45º56.869’ E006º54.622’ at an altitude of 3,254m. While this information is critical in guiding our expedition to recreate the photographs in the current day, digital photogrammetry methods also allow us to take the three-dimensional modelling one step further. By comparing stereo pairs of images, structure-from- motion algorithms are able to recreate the landscape as seen by Spelterini, including the 1909 ice surface. This means that we can compare not only the changing appearance of the landscape but also the difference in volume of ice over time. This method is commonly used by geologists to derive historical contour data from vertical aerial photographs taken for mapping purposes. What is unusual about Speleterini’s balloon photographs, beyond their antiquity, is that this method can be applied to such a limited sequence of oblique aerial photographs that were not intended for photogrammetry. Oblique views differ from vertical aerial photographs, more often used in mapping, because they are taken at an angle towards the horizon, rather than straight down. The oblique view tends to be easier to comprehend and can give a better sense of the landscape context of foreground details. While later surveys of the region have provided more thorough and measurable topographical data, Spelterini’s photographs offer a compelling glimpse into a landscape as it appeared a century ago, one which can now be visualised in three dimensions. 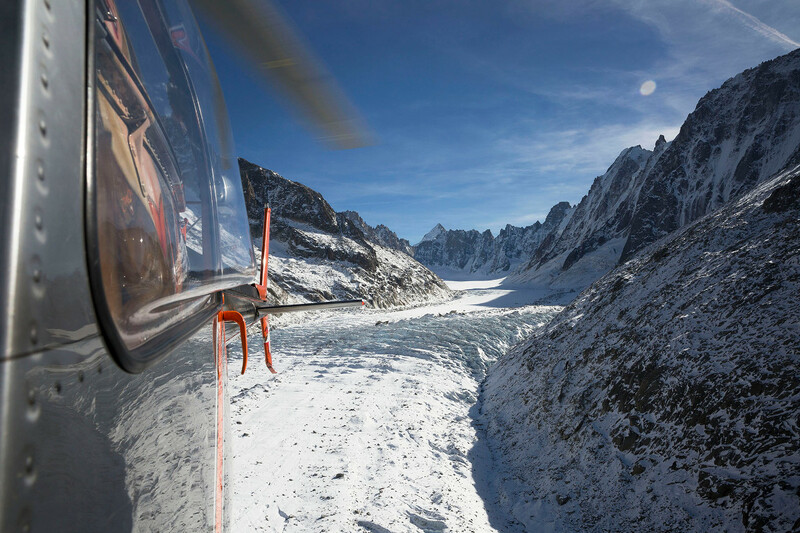 To recreate the historical photographs of the Mer de Glace glacier, Kieran Baxter photographed from the open door of a helicopter, accompanied by photographer and filmmaker Kieran Duncan. Photographs by Kieran Baxter and Kieran Duncan. 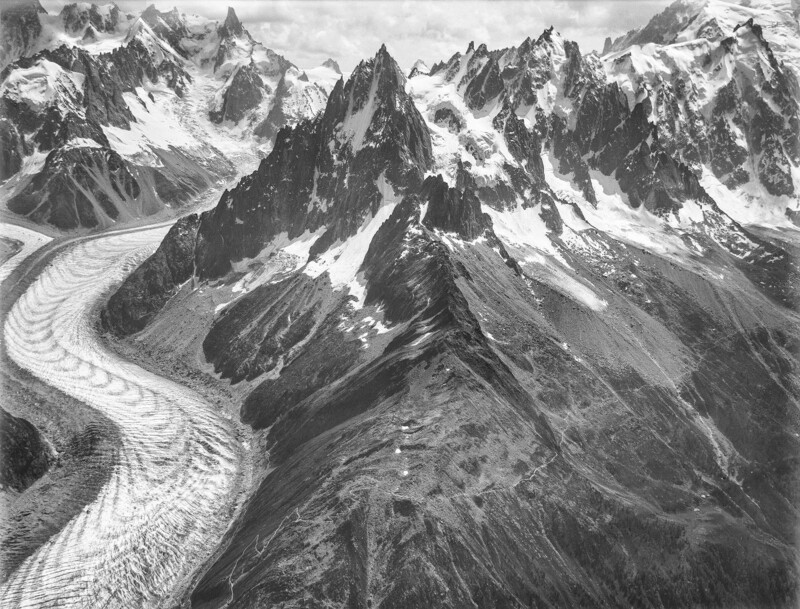 The successful digital reconstruction of the 1909 balloon flight raised the question of whether the photographs could be reconstructed in the current day, in order to see how the Mer de Glace had changed in the intervening century. In October 2017 I travelled from Scotland to Chamonix with photographer and filmmaker Kieran Duncan to attempt just that. 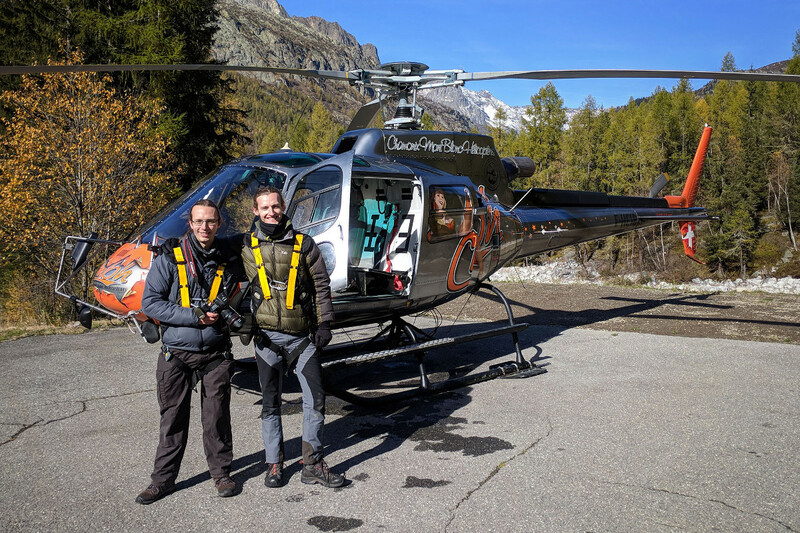 To reach the altitude of the balloon – many times higher than an unmanned aircraft or drone can safely fly – a helicopter was chartered for a thirty-minute flight from Argentière. This would provide just enough time to loop around the original flight path twice, allowing ample opportunity to gather the photographic material. There were two objectives during this flight. First, a sequence of photographs which mimic the arrangement of the original twelve images would be collected. This would allow for a three-dimensional model of the modern-day landscape that could be overlaid with the historical model. The photogrammetry process allows for varied camera positions and so there was no need for precision here, just a good range of distribution and coverage. 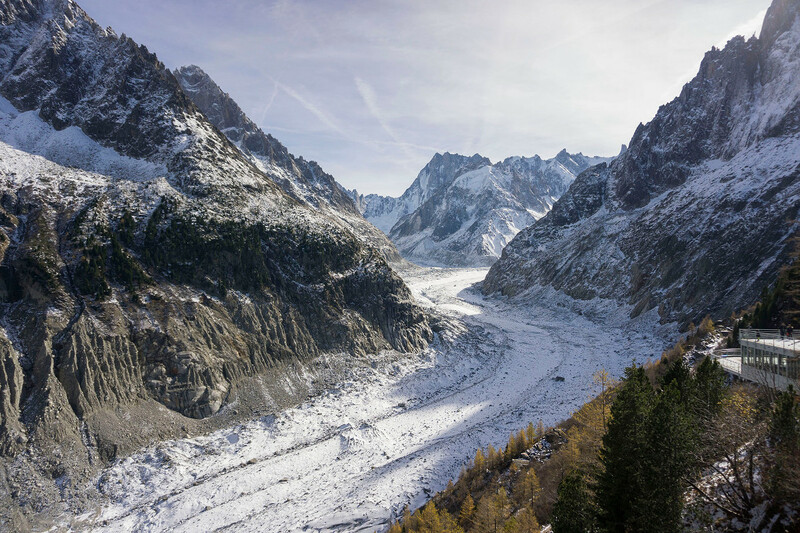 Second, using the GPS coordinates we would attempt to replicate one of the photographs of Mer de Glace as closely as possible to allow for a side-by- side comparison. Out of the sequence of Spelterini’s photographs one in particular stands out. 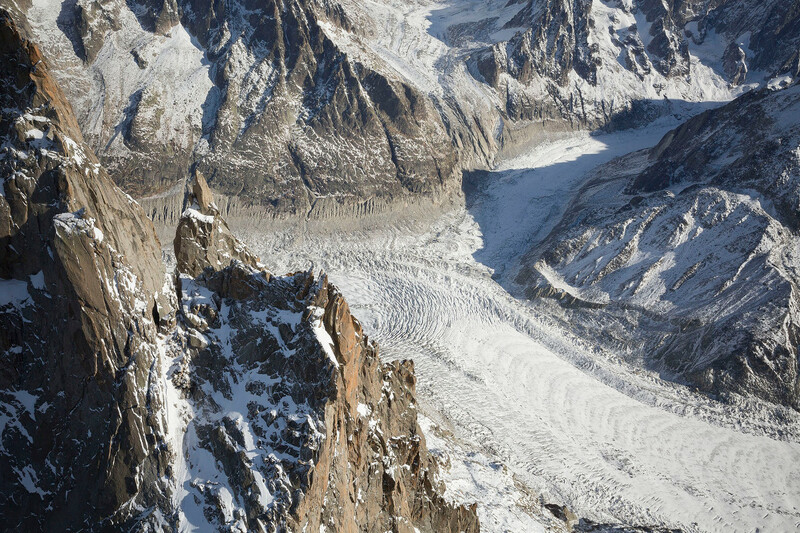 In this photograph, which Spelterini coloured and reprinted himself, the dramatic sweep of the Mer de Glace forms the central focus. This is the frame that we aimed to recreate in the current day. achieve this, both the pilot and photographer were equipped with GPS units preloaded with the locations of the original balloon photographs. 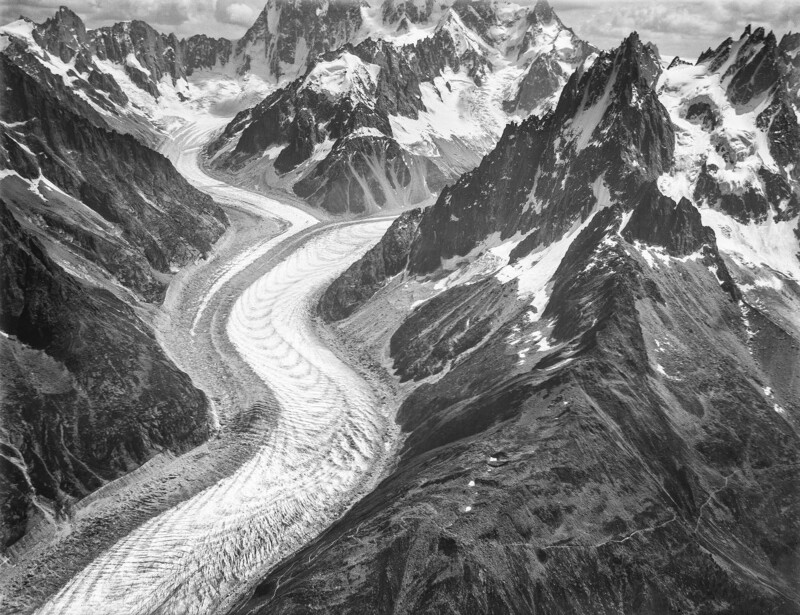 A comparison between a photograph of Mer de Glace taken by Eduard Spelterini in 1909 and the recreation of the same photograph taken by Kieran Baxter in 2017. 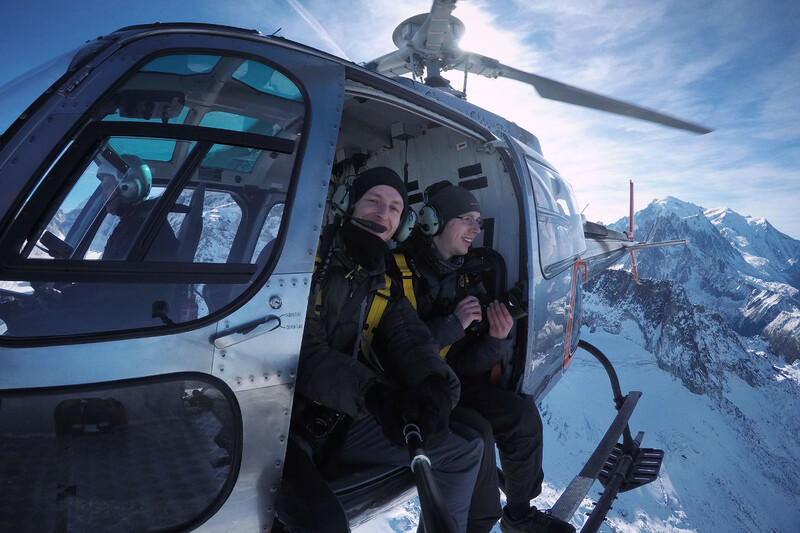 The alpine weather can be obstructive to aerial photography of any kind. Just as Spelterini was forced to wait for a suitable weather window, his balloon secured by guy lines until a period of calm would allow for a take-off, so our modern-day photography expedition was grounded for days by low clouds and rain. 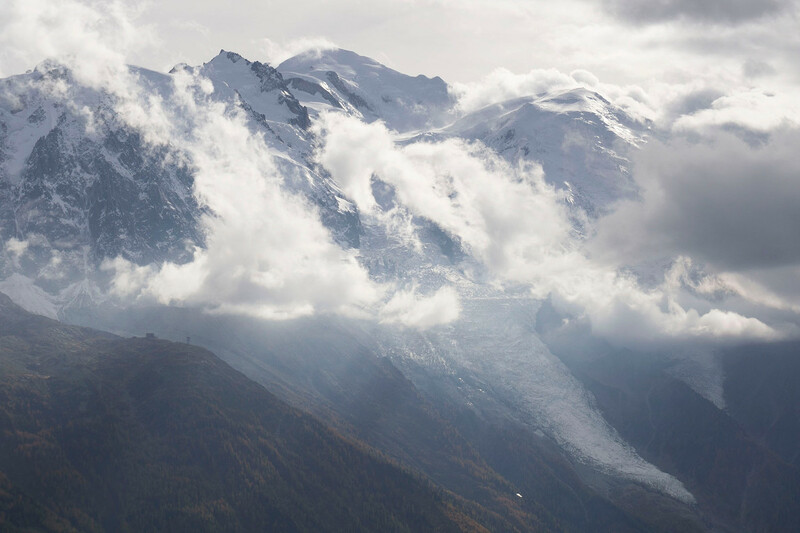 When the skies cleared, it was apparent that the rain that had been falling in Chamonix valley had settled as a layer of snow at the higher altitude of the glacier. While visually pleasing, this snow cover was obscuring some of the geomorphology, making it difficult to distinguish the ice margin from the surrounding moraines. This winter appearance was quite different from that of the landscape photographed during Spelterini’s August flight. Because of this, and despite our time pressure, the photography flight was delayed by a further twenty-four hours to allow for the snow to thin out enough to see the glacier margin clearly while still picking out the topography in a visually striking way. 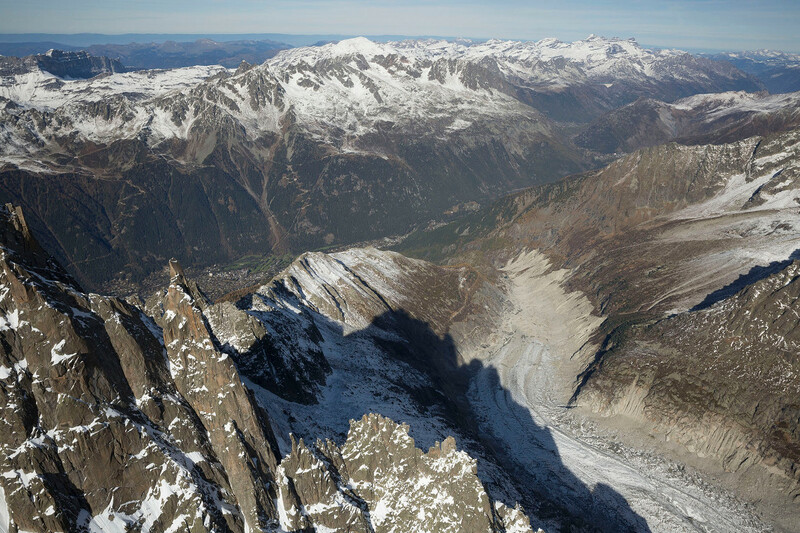 Photographs of the Argentière and Mer de Glace glaciers taken during the helicopter flight in October 2017. Photographs by Kieran Baxter. The door is left open during the flight with the photographer, harnessed to a safety tether, perched on the edge of the floor with feet resting on the helicopter skid. This provides a breathtaking wide angle view with the flexibility to shoot in all directions. Along with the handheld unit, the DSLR camera also has a GPS hot shoe attachment which embeds the position of each photograph taken into the camera metadata. While our intercom allows for communication with the pilot, when leaning out of the helicopter the fierce downdraft makes the microphone useless. 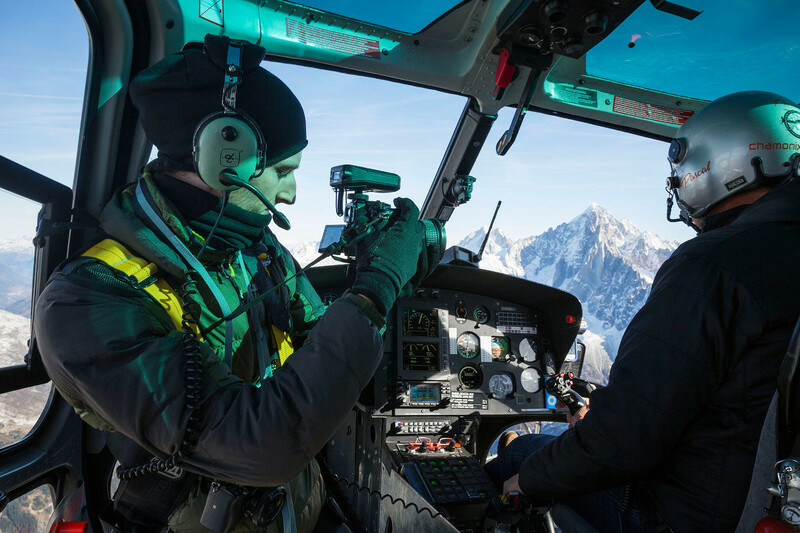 With careful planning and skilled maneuvering by pilot Pascal Brun, the photography circuit was successfully completed. 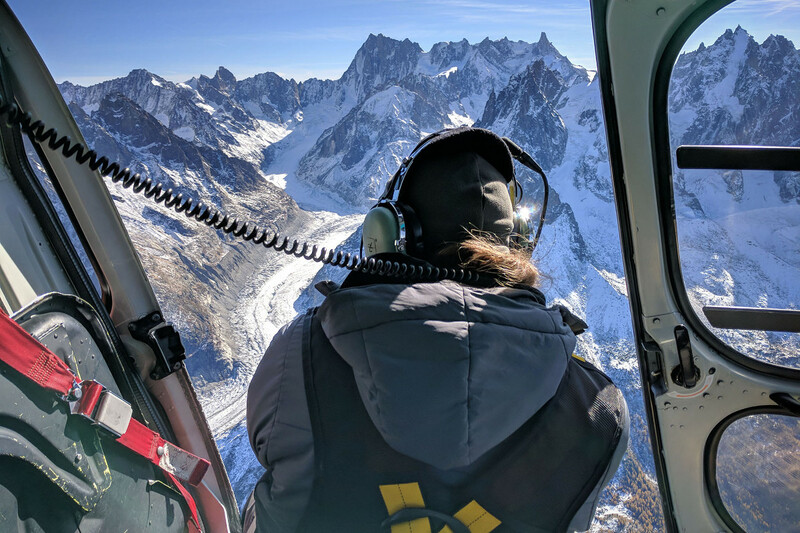 The helicopter returned to base via an exhilarating loop around the spires above Mer de Glace and a descent over Argentière Glacier. During just thirty minutes, over seven hundred aerial photographs were collected along with behind-the-scenes footage and images. This material has provided an ample resource to reconstruct the modern-day landscape in three dimensions in a way that can be overlaid with the historical imagery. Eduard Spelterini’s photographs take in the Montenvers railway and hotel, which were newly completed in 1909. The cogwheel railway carries visitors to a refuge which at the time of its opening would have directly overlooked, as its name suggests, the glacier’s “sea of ice”. Stepping out of the railway station today the visitor is greeted instead by a valley largely defined by bare rock and heaped moraines where the glacier once flowed. 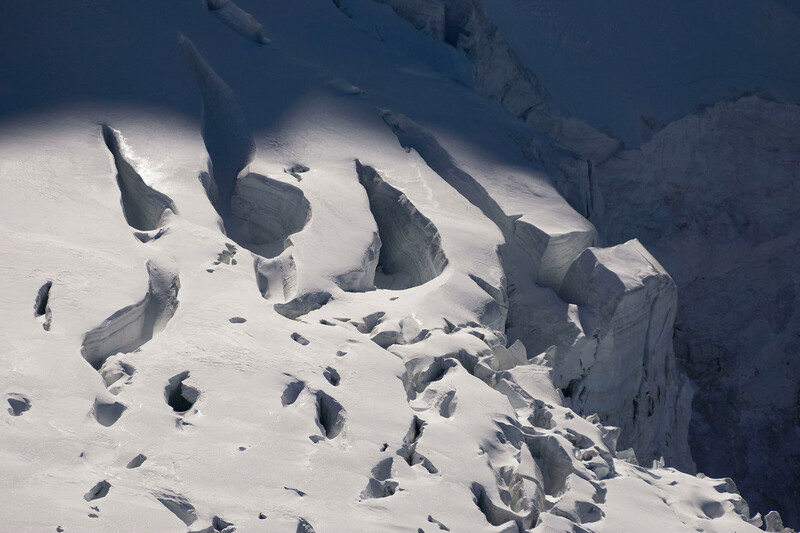 Much of the lower reaches of Mer de Glace are now debris covered as a result of the ice thinning out. 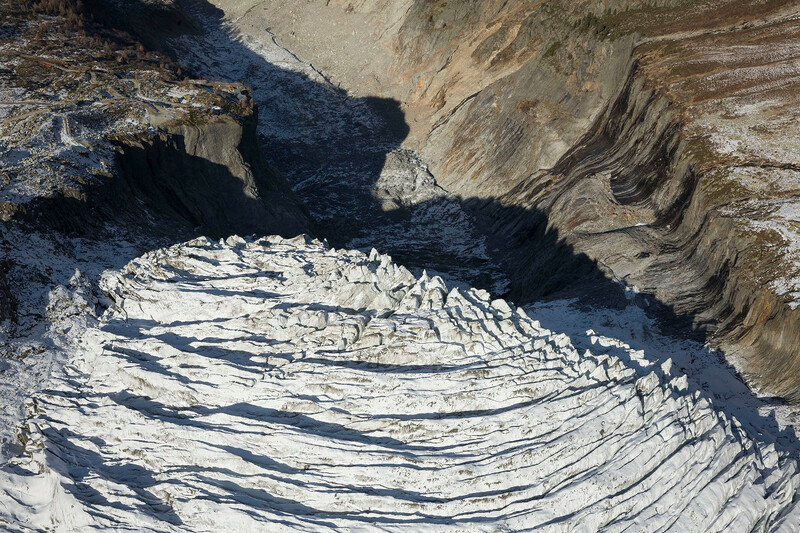 The ice surface remains visible from the Montenvers outlook only towards the distant higher ground and the glacier accumulation zone. While it remains a popular tourist attraction, the panoramic views that it was built for have changed radically over the last century. 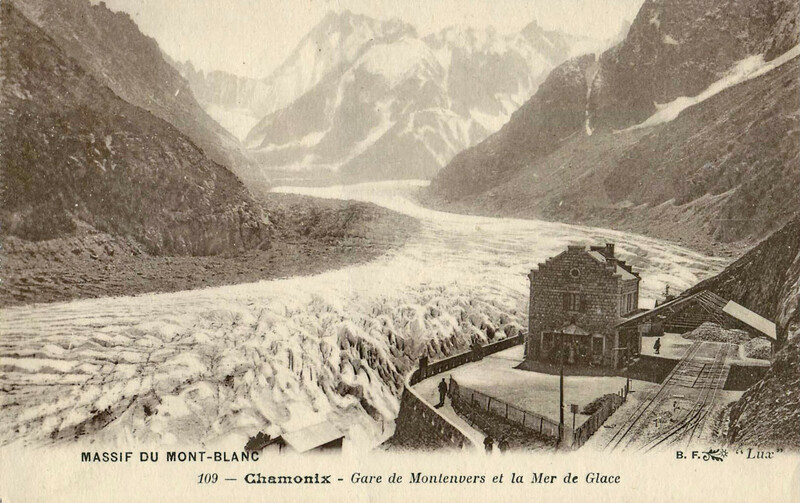 An early twentieth century postcard of the Montenvers railway station directly overlooking a “sea of ice” that is now massively diminished. Public domain image. 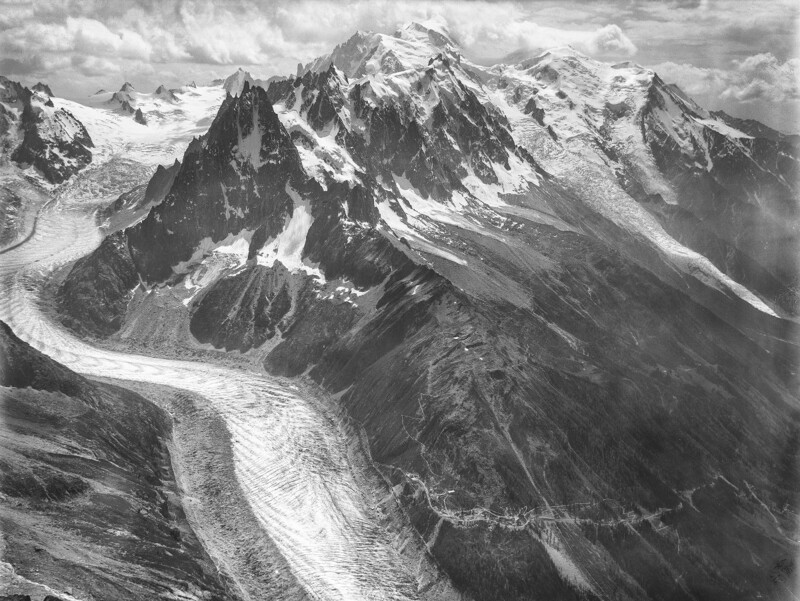 Among the archives of Spelterini’s alpine aerial photography, images which frame the glaciers as clearly as the Mer de Glace photographs are frustratingly few and far between. Argentière Glacier for example is only seen at the edge of the frame in two photographs that focus instead on the peaks behind. Perhaps this is an indication of the extent to which alpine glaciers were taken for granted in 1909. That such a substantial volume of ice could disappear from view certainly appears not to have concerned the architects of the Montenvers railway and hotel. Today we live in very different times where mountains of evidence and scientific understanding have raised concerns not only about the extent of changes in our climate over the last century, but also what this means for our long-term future. These changes are not only measurable, they are also visible in the disappearing glacial landscapes that hold a treasured place in our culture. 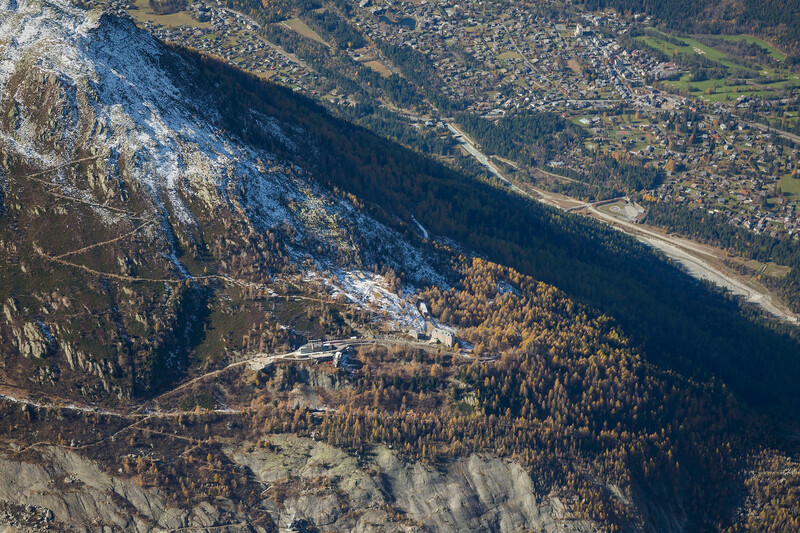 Montenvers railway station overlooks a valley now dominated by bare rock and glacial debris. Photographs by Kieran Baxter. The technologies of flight that have on the one hand made us more aware of our environment than ever before have also formed part of the dependency on fossil fuels which has in turn made a significant impact on our atmosphere and the stability of our climate. 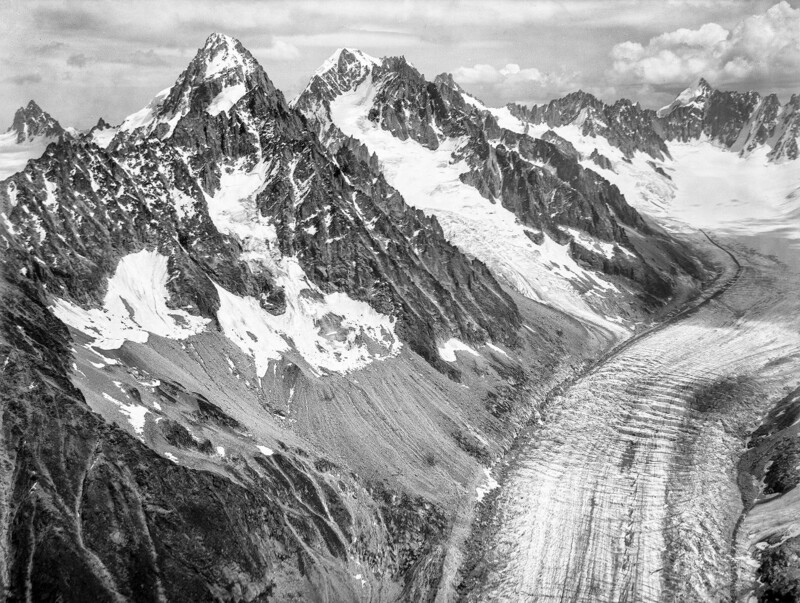 Spelterini and the aerial photographers who followed him were unwittingly making a record of glacial landscapes on the cusp of long-term change. Their interest was both scientific and aesthetic, and they have serendipitously recorded the first frames in a time-lapse sequence spanning centuries. 1909 balloon aerial photography by Eduard Spelterini / 2017 aerial photography and 3D visualisation by Kieran Baxter. Today we must consider how to continue this legacy and use the technology of the time to visualise these important landscapes for the present and future. We must consider the ways in which we may not be routinely recording these ephemeral places, and what we can be doing to allow future generations not only to see what the heritage of these temporal landscapes looked like, but also get a sense of how it felt to visit them. To achieve this requires collaboration by scientists and artists across interdisciplinary boundaries. 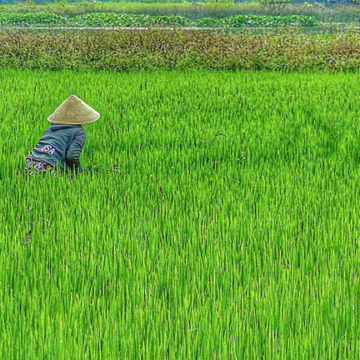 Where scientific evidence is no longer enough to change hearts and minds on the global climate crisis, perhaps a glimpse of the radical changes our familiar landscapes are undergoing, on a scale of only a few human generations, can serve to drive home an understanding of the rich natural and cultural legacies that are rapidly disappearing. 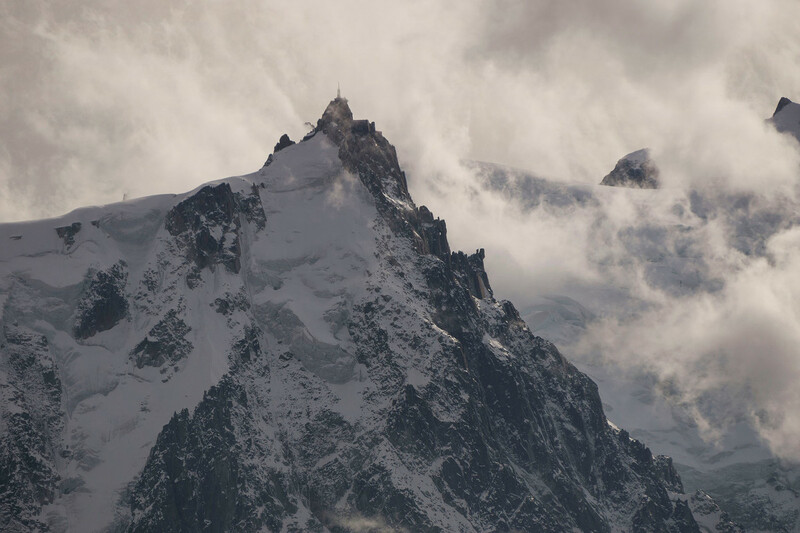 The Mont Blanc Massive is defined by the interation of dramatic weather, high peaks and glaciated valleys. In a rapidly changing climate the very character of this landscape is at risk.